The planet will be in "huge trouble" unless Barack Obama makes strides in tackling climate change, says a leading scientist. Prof James McCarthy spoke on the eve of the annual meeting of the American Association for the Advancement of Science (AAAS), which he heads. 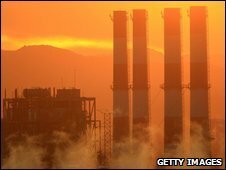 The US president has just four years to save the planet, said Prof McCarthy. If major policy changes do not happen within Mr Obama's term of office, they will not happen at all, he warned. "We have a moment right now of extraordinary opportunity, with a new president, positioned with scientific leadership that has known no equal in recent times," the AAAS president told BBC News. "The calibre of scientific advice that is close to this man is truly exceptional. "If in his first term, in the next four years, we don't make significant progress in these areas, then I think the planet is in huge trouble. "Without US leadership, which has been sorely lacking, we will not get to where we need to be." Climate change is high on the agenda of this year's AAAS meeting in Chicago. Former US Vice President Al Gore is among the speakers at the event, with 10,000 scientists expected to attend across the five days of the meeting. On the eve of the conference, Prof McCarthy told BBC News there was now a moment of opportunity to draw up policies that would be effective in combating climate change. He said: "Many scientists have wondered whether President Obama will be able to make commitments to investments in energy technology and understanding climate change - that were an important part of his campaign. "I know many of my colleagues looking at the fiscal situation, have felt that these good ideas might be put on the back burner. "That would be a terrible thing if that happened. "This is our window, with the science advice he has, with the realisation that these issues are pressing, if they are made second order I think we have really lost it."